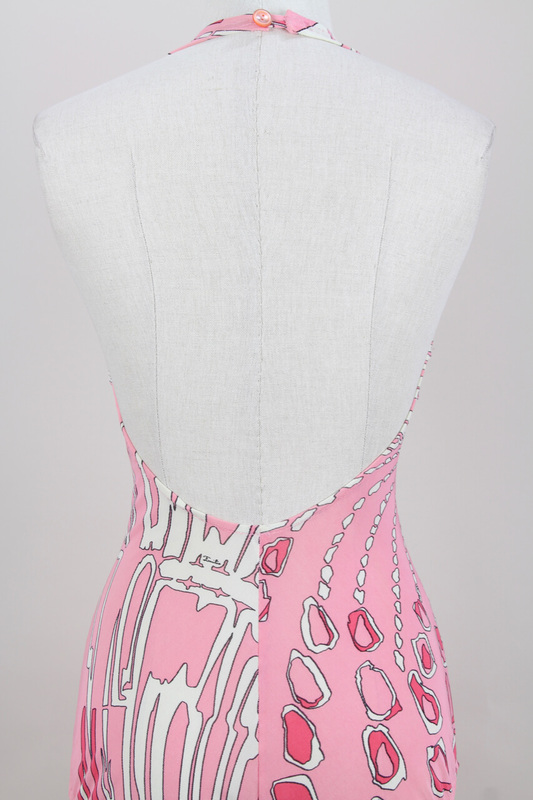 Fabulous pink signature print swimsuit by Emilio Pucci from the 1960s. 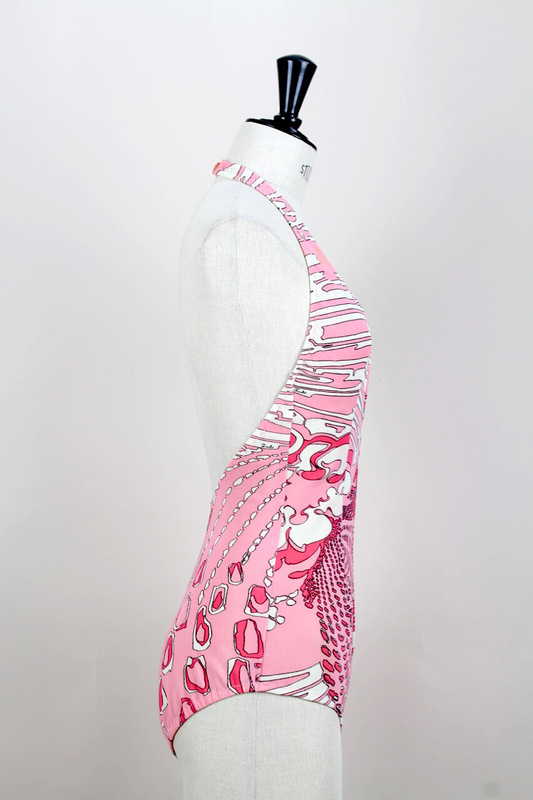 Add a dose of Emilio Pucci's 1960s signature jet set glamour to your beachwear or vintage fashion collection. 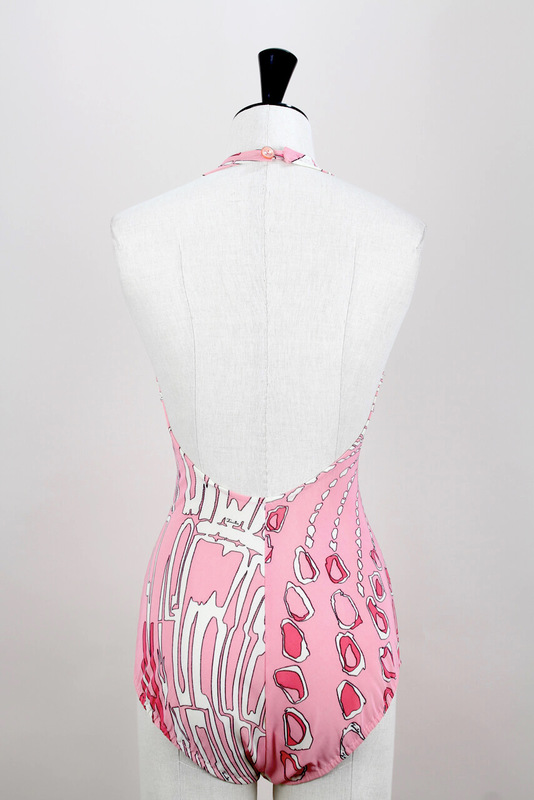 This beautiful and rare one-piece vintage swimsuit is splashed with one of Pucci's iconic abstract prints in shades of pink, white and black. The halter neck design with a low open back has been crafted in Italy from spandex mesh lycra that has with elastic at the neck and leg holes. 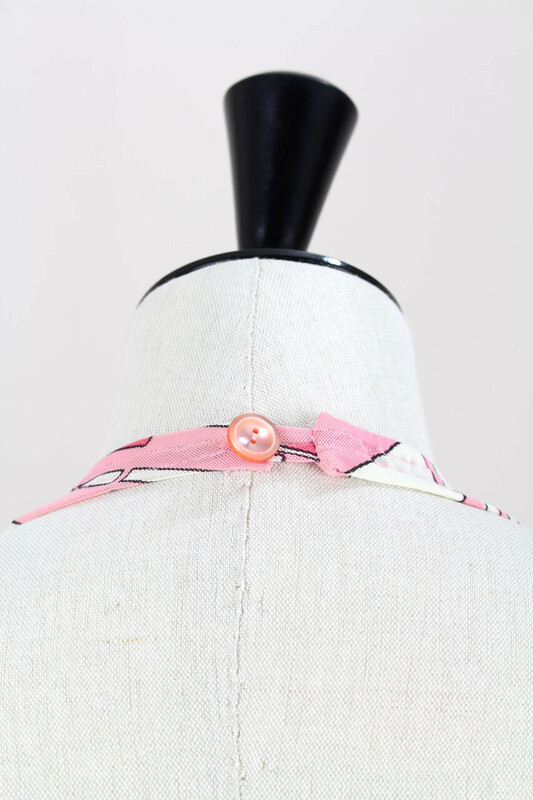 It is signed throughout “Emilio", partially lined at crotch and closes with a pink-hued button at the back of the neck. The labels read “EMILIO PUCCI FLORENCE – ITALY" and “100% SPANDEX LYCRA“. It is marked a Size 12 (Vintage). Marchese Emilio Pucci di Barsento was born in Naples, Italy in 1914. He opened his first boutique "La Canzone del Mare" (The song of the Sea) on the island of Capri in 1949. 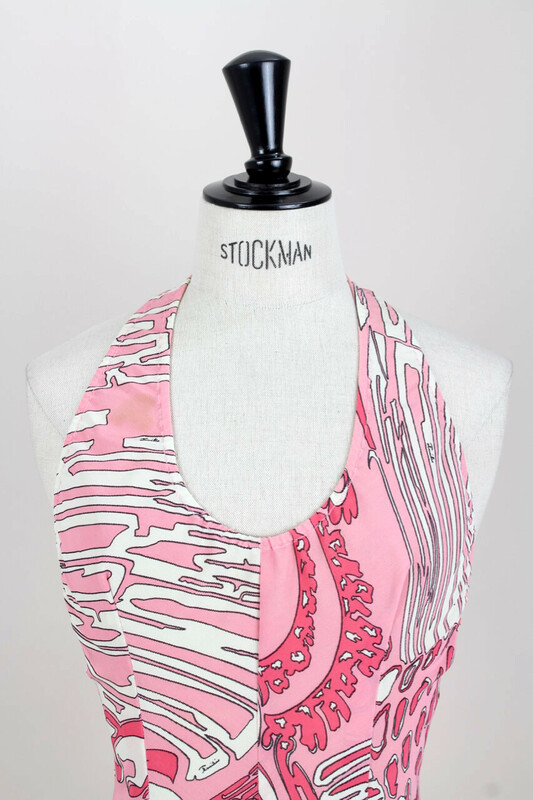 By the 1960s his signature look reigned as the ultimate status symbol for the decade and women like Marilyn Monroe, Lauren Bacall and Jacqueline Kennedy were seen in Pucci clothes. 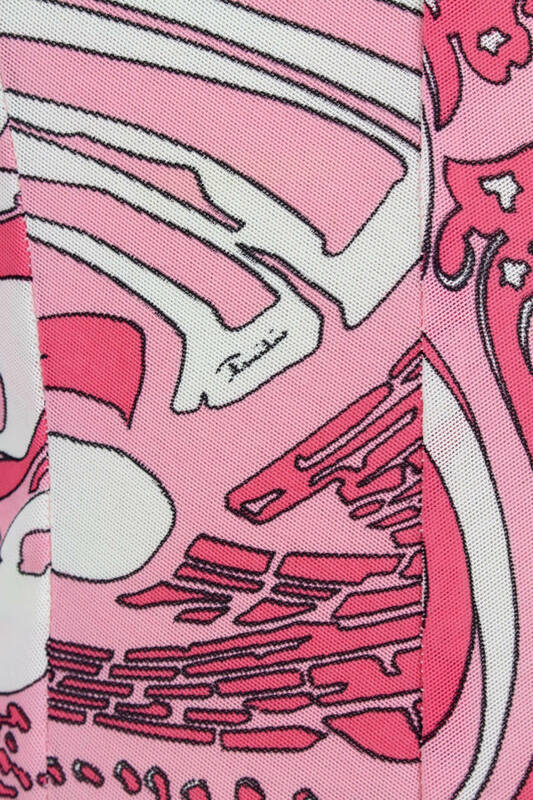 Pucci is known for his swirling, vivid prints and geometric patterns in bold psychedelic colours, His prints are signed "Emilio", rather than "Pucci". 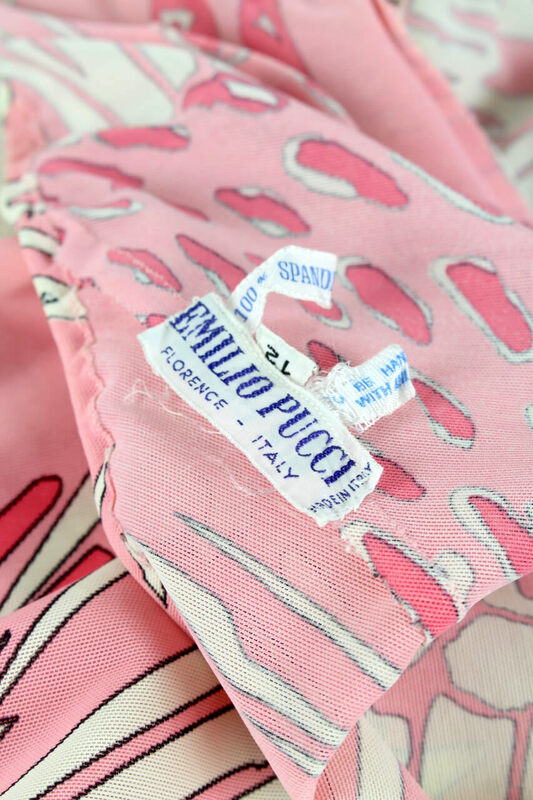 Emilio Pucci died in 1992. Excellent vintage condition. Elastic in excellent condition. Inner cotton lining in the crotch area is immaculate. One hardly visible yellowish spot on the right strap near the neck (please see first picture).